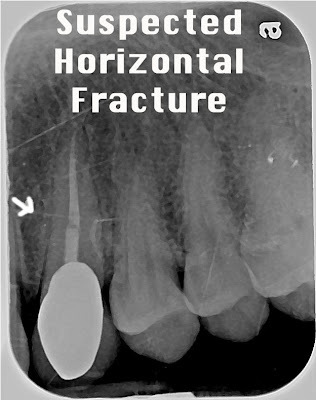 The Endo Blog: Horizontal Root Fracture? This tooth was referred to an oral surgeon for extraction and immediate implant placement on #11. A void between the post and the root canal filling is noted and it appears there may be some widening of the periodontal ligament adjacent to that void. There was purulence noted from the sulcus and the attached gingival tissue was inflammed. The tooth was otherwise asymptomatic. I was asked to do a consultation to confirm the horizontal fracture before the tooth was extracted. As I have mentioned in previous posts, root fractures are very difficult to diagnose. A second radiograph of the tooth appears normal. No sign of fracture or change in the periodontal ligament from this view. 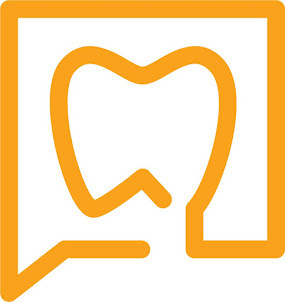 It does appear that there may be some coronal leakage on the distal margin of the crown. Another radiographic shift reveals that the post preparation was off center slightly with the canal. I explained to the patient and my oral surgeon colleague that the only way to know for sure would be to examine the tooth surgically or by removing the post and examining the tooth internally using the microscope. When given the option to evaluate the tooth microscopically and potentially retain the natural tooth, the patient elected to disassemble the post & crown and evaluate it. Microscopic examination as well as additional radiographs revealed no sign of horizontal fracture. Endodontic retreatment was completed and a post and core build up was completed. There is plenty of supracrestal bone to get a good ferrule for the new crown. Proper endodontic consultation allowed this patient to retain his natural tooth, save considerable time and money and be back to complete function in a matter of a few weeks. The endodontic part of the "multi-disciplinary" approach to implant treatment planning is often lacking. Diagnosis of root fracture rarely can be made by looking at a single film. Endodontic consultation is an important part of implant treatment planning. Was there any decay under the crown? That margin looked huge! Nice save there - the patient must have been thrilled to avoid unnecessary surgery!